^ 1.0 1.1 1.2 1.3 1.4 1.5 1.6 Spines, Christine. 'Juno': Inside Oscar's 100 Million Dollar Baby. Entertainment Weekly. 2007-12-05 [2013-06-23]. （原始内容存档于2012-09-14）. ^ 2.0 2.1 Juno. Box Office Mojo. [2013-11-01]. （原始内容存档于2013-10-21）. ^ adam. 新片介紹：《JUNO少女孕記》2月21日胎動全城. 荷里活電影手冊. 2008-02-03. ^ Juno (2007) – Daily Box Office Results. Box Office Mojo. [2013-06-23]. （原始内容存档于2013-05-12）. ^ Hulbert, Ann. Juno and the Culture Wars. Slate. 2007-12-18 [2013-06-23]. （原始内容存档于2012-11-21）. ^ 7.0 7.1 Dawson, Jeff. Diablo Cody, lap dancer turned ace screenwriter. The Sunday Times. London. 2008-01-20 [2011-05-17]. （原始内容存档于2011-05-17）. ^ Freeman, Hadley. A choice that films ignore. The Guardian. 2008-01-28 [2013-06-23]. （原始内容存档于2012-11-11）. ^ Scott, A. O. Seeking Mr. and Mrs. Right for a Baby on the Way. New York Times. 2007-12-05. ^ 10.0 10.1 Howell, Peter. Juno star has a mind of her own. Toronto Star. 2008-01-30 [2013-06-23]. ^ 11.0 11.1 Hiscock, John. Diablo Cody:'I feel more naked writing than I did as a stripper'. The Daily Telegraph. 2008-02-02 [2013-11-01]. （原始内容存档于2012-06-20）. ^ Douglas, Edward. The Inimitable Ellen Page on Juno. ComingSoon.net. 2007-12-03 [2013-06-23]. （原始内容存档于2012-10-18）. ^ 13.0 13.1 13.2 13.3 Douglas, Edward. Jason Reitman Tackles Teen Pregnancy in Juno. ComingSoon.net. 2007-12-07 [2013-06-23]. （原始内容存档于2012-10-18）. ^ Sperling, Nicole. 'Juno' Has Moviegoers Bringing Up Babies. Entertainment Weekly. 2008-01-18 [2013-06-23]. （原始内容存档于2012-10-05）. ^ Schlafly, Phyllis. Message of 'Juno': Fatherlessness rocks. WorldNetDaily. 2008-03-14. （原始内容存档于2008-03-15）. ^ Morris, Wesley. 'Juno' lets smart girls identify with its glib but sweet spin on a teen's life-altering decision. The Boston Global. 2008-02-24 [2013-06-23]. ^ 17.0 17.1 Dibdin, Emma. Labour Day: Behind the scenes on Juno. The Cambridge Student. 2008-02-07 [2013-06-23]. （原始内容存档于2012-04-27）. ^ 18.0 18.1 Maher, Dave. Ellen Page Talks Juno Soundtrack, Kimya Dawson. Pitchfork Media. 2007-11-21 [2013-06-23]. （原始内容存档于2010-09-24）. ^ Juno's Jason Reitman. [2013-06-23]. （原始内容存档于2012-08-20）. ^ 20.0 20.1 20.2 Valby, Karen. Diablo Cody: From Ex-Stripper to A-Lister. Entertainment Weekly. 2007-11-02 [2013-06-23]. （原始内容存档于2013-05-27）. ^ Giese, Rachel. Whoa, baby. CBC News. 2007-12-10 [2013-05-23]. （原始内容存档于2007-07-03）. ^ From saucy to sweet. The Age. Associated Press. 2008-01-05 [2013-11-01]. （原始内容存档于2012-11-02）. ^ Carroll, Larry. 'Juno' Cast, Director Credit Diablo Cody's Screenplay For Flick's Early Buzz. MTV News. 2007-12-13 [2013-11-01]. （原始内容存档于2012-10-24）. ^ EXCLUSIVE INTERVIEW: Director Jason Reitman Talks Juno. MovieWeb.com. 2007-12-28 [2013-11-01]. （原始内容存档于2013-09-30）. ^ Orndorf, Brian. Jon Poll interview – CHARLIE BARTLETT. Collider.com. 2008-02-18 [2013-11-01]. （原始内容存档于2012-08-26）. ^ Fleming, Michael; Siegel, Tatiana. Jason Reitman flies 'Up in the Air'. Variety. 2008-05-14 [2013-11-01]. （原始内容存档于2013-06-23）. ^ Yamato, Jen. Ellen Page on Juno: The RT Interview. rotten tomatoes. 2007-12-06 [2013-11-01]. （原始内容存档于2009-12-01）. ^ Sperling, Nicole. Bateman, Janney join 'Juno' family. The Hollywood Reporter. 2007-02-22. （原始内容存档于2008-05-24）. ^ Starker, Melissa. To know Juno. Columbus Alive. 2007-12-20 [2011-08-13]. （原始内容存档于2011-08-13）. ^ Vaux, Rob; Davis, Debbie. The Juno Interviews Part III: Allison Janney & J.K Simmons. FlipsideMovies.com. 2008-01-27 [2009-01-16]. （原始内容存档于2009-01-16）. ^ Stack, Tim. Olivia Thirlby: Life After 'Juno'. Entertainment Weekly. 2008-06-13 [2013-11-01]. （原始内容存档于2013-10-23）. ^ 33.0 33.1 Garibay, Lisa Y. My Super Sweet 16. Filmmaker Magazine. 2008-01-28 [2013-11-01]. （原始内容存档于2013-10-23）. ^ Braver, Rita. "Juno" Director Follows In Dad's Footsteps. CBS News. 2008-02-10 [2013-11-01]. （原始内容存档于2012-10-22）. ^ Adler, Shawn; Carroll, Larry. Movie File: 'Departed' Trilogy, Jennifer Garner, Steve Carell & More. VH1. 2007-01-17 [2007-01-31]. （原始内容存档于2007-01-25）. ^ Vaux, Rob. The Juno Interviews Part II: Jason Bateman. FlipsideMovies.com. 2008-01-27 [2009-01-16]. （原始内容存档于2009-01-16）. ^ Palmer, Tamara. Big-screen chemistry. Metromix. 2008-01-17 [2012-03-13]. （原始内容存档于2012-03-13）. ^ 38.0 38.1 38.2 38.3 38.4 Jason Reitman; Diablo Cody. Juno: Audio Commentary by Director Jason Reitman and Writer Diablo Cody (DVD). 20th Century FOX. 2007. ^ 39.0 39.1 39.2 39.3 Schaefer, Glen. Plenty of fun and games on Juno set. The Province. 2008-02-24 [2013-09-21]. （原始内容存档于2012-11-05）. ^ "Juno" Considering 2007 Minnesota Location. Frozen Frames. 2008-01-02 [2013-09-21]. （原始内容存档于2012-11-09）. ^ Epstein, Edward Jay. Northern Expenditure. Slate. 2006-02-13 [2013-09-21]. （原始内容存档于2012-12-02）. ^ Macdonald, Moira. Northwest links to Oscars. Seattle Times. 2008-02-22 [2013-09-21]. （原始内容存档于2012-10-13）. ^ 43.0 43.1 43.2 43.3 Mackie, John. Vancouverites sharing in success of 'Juno'. Regina Leader-Post. 2008-01-29 [2013-09-21]. （原始内容存档于2012-11-05）. ^ INTERVIEW: Juno's Ellen Page and Michael Cera. MovieWeb.com. 2007-12-06 [2013-09-21]. （原始内容存档于2012-07-16）. ^ Walker, Jeremy. Production begins on 'Juno,' a comedy directed by Jason Reitman from a screenplay by Diablo Cody. JeremyWalker.com. 2008-02-14 [2013-09-21]. （原始内容存档于2012-02-19）. ^ Reitman, Jason. Music from the Motion Picture Juno (Liner Notes). 2007-11-04. ^ Lucy. Juno Soundtrack: Best Soundtrack of The Year?. Product-Reviews (Dansway Communications Ltd). 2007-09-12 [2011-07-25]. （原始内容存档于2011-07-25）. ^ Sciretta, Peter. Juno Movie Sountrack. /Film. 2007-09-11 [2013-09-24]. （原始内容存档于2012-08-14）. ^ 49.0 49.1 49.2 49.3 49.4 Jason Reitman; Ellen Page; Kimya Dawson. Juno Soundtrack Interview (Podcast). Rhino Entertainment. [2013-09-24]. （原始内容存档于2012-02-15）. ^ 50.0 50.1 Seattlest Interview: Mateo Messina, Film and Symphony Composer. Seattlest. 2007-11-02 [2013-09-24]. （原始内容存档于2012-02-12）. ^ Celis, Barbara. Interview: Jason Reitman (Juno). ioncinema.com. 2007-12-05 [2013-11-01]. ^ Douglas, Edward. 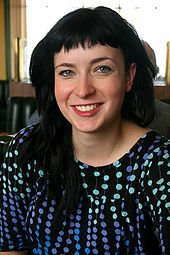 Juno Screenwriter Diablo Cody. ComingSoon.net. 2007-12-13 [2013-11-01]. （原始内容存档于2013-09-29）. ^ O'Neil, Tom. Costume guild nominees: 'Atonement,' 'La Vie en Rose'. The Los Angeles Times. 2008-01-16 [2013-09-24]. （原始内容存档于2012-02-14）. ^ Bennett, J. Close-Up. Alternative Press Magazine (Alternative Press Magazine, Inc.). 2008年1月, 234: 74–75. ^ Wharton, Kate. Ellen Page interview. Marie Claire. 2008-02-05 [2013-09-24]. （原始内容存档于2012-08-30）. ^ 56.0 56.1 56.2 56.3 Morrow, Martin. Credit where it's due. CBC News. 2008-02-18 [2010-01-26]. （原始内容存档于2010-01-26）. ^ 57.0 57.1 Pearson, Ryan. Where'd the credits go?. Associated Press. 2007-09-13 [2007-10-12]. （原始内容存档于2007-10-12）. ^ 58.0 58.1 58.2 Vlaanderen, Remco. Forget the Film, Watch the Titles. SubmarineChannel. 2007 [2013-06-23]. （原始内容存档于2012-10-31）. ^ Jones, Michael. Telluride abuzz with "Juno". Variety. 2007-09-01 [2012-10-24]. （原始内容存档于2012-10-24）. ^ Willman, Chris. Telluride Day 4: ‘Juno,’ ‘Margot at the Wedding’. Entertainment Weekly. 2007-09-03 [2013-06-23]. （原始内容存档于2012-07-29）. ^ Ebert, Roger. Toronto #5: Great performances, strong stories. Chicago Sun-Times. 2007-09-09 [2013-11-01]. （原始内容存档于2013-05-08）. ^ 62.0 62.1 Morfoot, Addie. "Juno" wins in Rome. Variety. 2007-10-28 [2013-05-23]. （原始内容存档于2012-10-20）. ^ 16th Annual AT&T St. Louis International Film Festival: Festival Highlights. Cinema St Louis. 2007-11-22. （原始内容存档于2008-03-03）. ^ Stockholm Festival Winners 2007. Stockholm International Film Festival. [2012-02-16]. （原始内容存档于2012-02-16）. ^ Juno To Receive Chairman’s Vanguard Award at 19th Annual Palm Springs International Film Festival Awards Gala. Palm Springs International Film Festival. 2007-11-08 [2013-11-01]. （原始内容存档于2012-02-15）. ^ Sciretta, Peter. Juno’s "Due Date" Sooner Than Expected. /Film. 2007-10-25 [2013-11-01]. （原始内容存档于2013-09-27）. ^ 67.0 67.1 67.2 McClintock, Pamela. 'Juno' jolts specialty box office. variety. 2007-12-09 [2013-11-01]. （原始内容存档于2013-06-23）. ^ Breznican, Anthony. Box office: Modest films, niche marketing change landscape. USA Today. 2008-02-22 [2013-06-23]. （原始内容存档于2012-10-23）. ^ Barefoot, Darren; Szabo, Julie. Great Movie Marketing and a Hamburger Phone From Juno. SocialMediaReady.com. 2008-01-27 [2012-08-14]. （原始内容存档于2012-08-14）. ^ Moses, Asher. Juno's hamburger phone sparks online sales. The Age. 2008-02-07 [2013-06-23]. （原始内容存档于2012-11-02）. ^ 71.0 71.1 Harris, Misty. Hamburger the new accessory. The Province. 2008-01-29 [2013-06-23]. （原始内容存档于2012-11-05）. ^ 10 Cool Gifts for Film Buffs. Entertainment Weekly. [2013-11-01]. （原始内容存档于2013-10-21）. ^ Honest To Blog: Juno is the Most Successful Indie Film in Six Years; DVD Details. SlashFilms. [2013-11-01]. （原始内容存档于2012-08-20）. 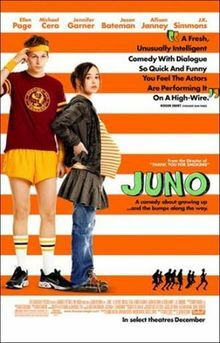 ^ Juno (2007). rotten tomatoes. [2013-11-01]. （原始内容存档于2013-11-01）. ^ 1—Juno. rotten tomatoes. [2013-11-01]. （原始内容存档于2013-10-24）. ^ Juno (2007): Reviews. Metacritic. [2013-11-01]. （原始内容存档于2013-09-11）. ^ Ebert, Roger. Juno. Chicago Sun-Times. 2007-12-14 [2013-11-01]. （原始内容存档于2013-10-02）. ^ The 500 Greatest Movies of All Time. empireonline.com. [2013-11-01]. （原始内容存档于2013-10-17）. ^ 100 Greatest Movie Characters. empireonline.com. [2013-09-14]. （原始内容存档于2012-11-16）. ^ The 50 Best Movies of the Decade (2000-2009). Paste Magazine. 2009-11-03 [2013-09-14]. （原始内容存档于2013-08-30）. ^ Adam B. Vary. The 100 Greatest Characters of the Last 20 Years: Here's our full list!. Entertainment Weekly. Time Corp. 2010-06-01 [2013-09-14]. （原始内容存档于2013-08-23）. ^ Edelstein, David. Melodrama in Distress. New York. 2007-11-30 [2013-11-01]. （原始内容存档于2013-10-28）. ^ Jim DeRogatis. Why "Juno" is anti-rock. Chicago Sun-Times. 2008-01-08. （原始内容存档于2012-10-19）. ^ Pompeo, Joe. Juno Crosses the $100 Million Mark, Becomes 'Too Cool'. The New York Observer. 2008-01-31 [2013-09-14]. （原始内容存档于2012-08-13）. ^ Stevens, Dana. Hating Juno. Slate. 2008-02-08 [2013-09-14]. （原始内容存档于2013-07-28）. ^ Kingsbury, Kathleen. Pregnancy Boom at Gloucester High. Time. 2008-06-18 [2013-09-14]. （原始内容存档于2013-09-14）. ^ The Juno Effect. Northland's NewsCenter. Granite Broadcasting Corporation. 2010-08-06 [2013-09-14]. （原始内容存档于2012-03-14）. ^ Kranish, Michael. Palin's daughter, 17, is pregnant. The Boston Global. 2008-09-02 [2013-09-14]. （原始内容存档于2012-10-22）. ^ Unplanned. Houston Chronicle. 2008-09-02 [2013-09-14]. （原始内容存档于2012-10-11）. ^ 90.0 90.1 Wieseltier, Leon. Washington Diarist. New Republic. 2008-09-02 [2013-11-01]. （原始内容存档于2013-11-01）. ^ 91.0 91.1 Friedman, Roger. The 'Juno' effect strikes again. Foxnews. 2008-09-02 [2013-11-01]. （原始内容存档于2013-11-01）. ^ Jason Bateman Defends ‘Juno’ In Wake Of Massachusetts Teen Pregnancies. Access Hollywood. 2008-09-13 [2013-06-23]. （原始内容存档于2012-02-17）. ^ Benfer, Amy. Death to 'the "Juno" effect'. Salon. 2010-04-09 [2013-11-01]. （原始内容存档于2013-01-20）. ^ Roger Ebert. The year's ten best films and other shenanigans. Chicago Sun-Times. 2007-12-20 [2013-06-23]. （原始内容存档于2013-06-02）. ^ Signs of Life 2007: Best Films. Paste. 2007-11-28 [2013-06-23]. （原始内容存档于2012-10-20）. ^ Ten Best List for the Year 2007. United States Conference of Catholic Bishops. [2011-08-08]. （原始内容存档于2011-08-08）. ^ The 50 Best Movies of 2007 (and the 10 Worst). Moviefone. 2007-12-20 [2013-06-23]. （原始内容存档于2012-10-10）. ^ Berardinelli, James. List: 2007 Films, Descending Order by Rating. ReelViews.net. [2013-11-01]. ^ 100.0 100.1 100.2 100.3 100.4 100.5 100.6 100.7 100.8 100.9 Metacritic: 2007 Film Critic Top Ten Lists. Metacritic. （原始内容存档于2008-01-02）. ^ Roeper and Scott Top Ten Lists (2006-2007). intermind.com. 2010-02-03 [2013-05-23]. （原始内容存档于2011-10-16）. ^ Travers, Peter. Peter Travers' Best and Worst Movies of 2007. Rolling Stone. 2007-12-27 [2009-05-03]. （原始内容存档于2009-05-03）. ^ 103.0 103.1 103.2 The 80th Academy Awards (2008) Nominees and Winners. the Academy of Motion Picture Arts and Sciences. [2013-11-01]. （原始内容存档于2013-10-14）. ^ Andre Soares. Genie Awards 2008 Winners. 2008-03-04 [2013-09-24]. （原始内容存档于2011-06-06）. ^ 105.0 105.1 105.2 Andrews, Marke. No Genie nominations for Vancouver's Juno. The Vancouver Sun. 2008-02-29 [2013-09-24]. （原始内容存档于2012-11-04）. ^ 106.0 106.1 Canadian Comedy Awards Festival Award Winners. [2013-11-01]. （原始内容存档于2013-10-03）. ^ 107.0 107.1 Dawtrey, Adam. 'Atonement' tops BAFTA Awards; Cotillard, Day-Lewis take best acting honors. Variety. 2008-02-10 [2013-09-24]. （原始内容存档于2013-06-19）. ^ Cheng, Jim. Critics' Choice Awards: Dark, violent 'No Country' and 'Blood' on top. USA Today. 2008-01-07 [2013-09-24]. （原始内容存档于2012-10-20）. ^ Mike Bruno. Indie Spirit Awards Give 'Juno' Top Prize. EW.com. 2008-02-25 [2013-09-14]. （原始内容存档于2009-04-21）. ^ 111.0 111.1 Stephen Thomas Erlewine. Juno - Original Soundtrack. AllMusic. 2008 [2013-11-01]. （原始内容存档于2013-11-01）. ^ Hasty, Katie. 'Juno' Unseats Keys From Atop Album Chart. Billboard. 2008-01-30 [2012-10-14]. （原始内容存档于2012-10-14）. ^ Hansen, Christina. Rhino to release Juno B-Sides exclusively on iTunes. Paste. 2008-04-01 [2013-09-14]. （原始内容存档于2012-10-20）. ^ Mannering, Christy. Juno Proved Grand Movies Require Grander Soundtracks. TheSpaceLab.tv. 2008-11-23 [2013-09-14]. （原始内容存档于2012-02-14）.